Sony has injected some competition back into the mobile gaming market with the launch of the PlayStation Vita handheld console in Japan on Saturday. The successor to the PlayStation Portable (PSP), the PS Vita is a next-generation gaming device designed in attempt to reclaim market share from iOS and Android smartphones, which currently hold about 60 percent of all mobile game sales. The PS Vita features a 5-inch (12cm) LED touch-sensitive screen, front and back-facing cameras and dual joysticks. It’s powered by a quad-core processor with architecture similar to the Apple A5 chip, has support for GPS, BlueTooth, Wi-Fi and there is also an optional 3G model. Gamers will be able to join multiplayer games over the PlayStation Network, connecting wirelessly over cellular or Wi-Fi internet connection. 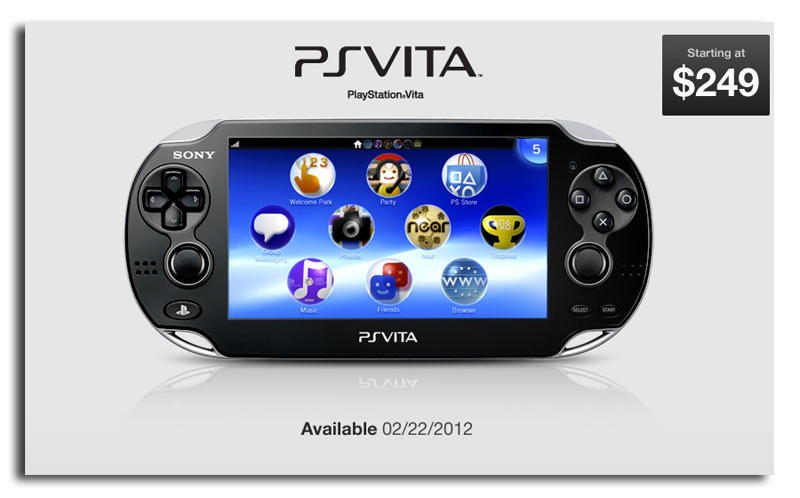 When the PlayStation Vita arrives in the U.S. in February 2012, it will retail for $249.99 (Wi-Fi only) and $299.99 for the 3G version.